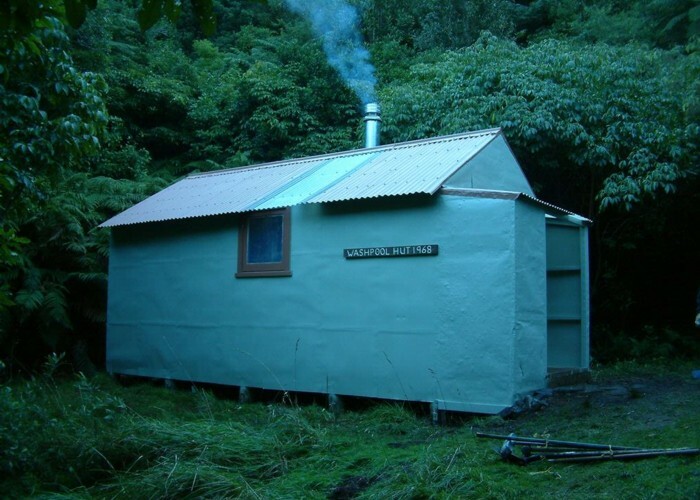 A standard DOC hut in the Haurangi Ranges on a small terrace in thick bush 60m above Washpool Creek. It manages to occupy the dampest location in the whole park - in the morning the hut, trees, grass were soaked, but travel 50m in any direction they were stone dry! This is confirmed by the mold-blackened mattresses inside. Not appealing - but thankfully there's enough visitors to wear a body-shaped clean patch on each! There's a wood-burner, and firewood around. No water tank - but a small stream lies 20m to the west, or there's the Makatukutuku at the bottom of the hill. Most visitors are overnighters coming from the Pinnacles, or walking the 2-3 day track from the pinnacles to Cape Palliser. The river offers possibility of loop walks back to the coast, and the ridgeline to the south of the hut has a good, marked route to the 4wd Sutherland Road and Sutherlands Hut. See the related article for a good account of the Pinnacles track and river route. There's no water tank, but there is a stream maybe 50m NE of the hut with reasonably easy access. Added 17 June 2010 by madpommadpom. 4 revisions, most recently 4 June 2018 by diggndiggn. 254 views in the past year (21 per month).